Fig. 4.53 a,b a US scan of lateral compartment of ankle.The anterior talofibular ligament is completely torn (arrowheads) with abundant effusion. b MR scan in the same patient (axial scan,TSE T2W). Arrowhead = tear power Doppler analysis allows the presence of diffuse perilesional hyperemia to be detected. 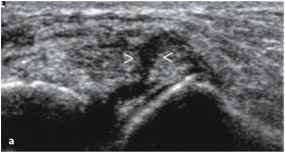 In the presence of fibrous and scar tissue resulting from a post-traumatic ligament lesion, US shows typically focal hypoechoic tissue. In some cases, minute calcification can also be found. it is possible to detect some characteristic ultrasound signs of degeneration in several inflammatory pathologies. Myositis shows a diffuse reduction in the echogenicity of the tissues that is directly proportional to the amount of inflammatory edema in the fibrillar muscular structure. In spite of US being considered the gold standard for the diagnosis of muscle pathology, it has a very important role and should be considered the first choice imaging technique. When an inflammatory, degenerative or a malignant pathology is in progress, US must be complemented with computed tomography (CT) or MR, while in the cases of trauma it is mostly exhaustive. - traumatic (major and minor lesions). Rheumatology mostly deals with inflammatory and degenerative pathology, but a deep knowledge of the other lesions is necessary for a correct differential diagnosis. Serous myositis has a traumatic, toxi-infective or viral origin. It is characterized by interstitial inflammatory, hyperemia and serous infiltration of the perimysium. The thickening of the muscle fascicles is a typical degenerative after-effect. In the earlier stages, the muscular structure can be easily assessed with US and it appears thickened and diffusely hypoechoic, due to the perimysial edema, with hazy muscular fascicles that appear interrupted and spaced (Fig. 4.54). In the later stages, fibro-adipose involution has an inhomogeneous appearance. Purulent myositis, usually caused by deep and infected wounds or by blood flow-derived bacteria, is characterized by several scattered abscessed foci. With US, the abscess appears as a hypo-ane-choic rounded mass, with hazy margins and inho-mogeneous echoes . This kind of examination allows the size and the site of the abscess to be precisely described and a percutaneous drainage of the purulent material to be performed. 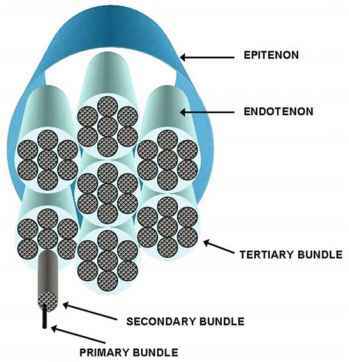 In the later stages, the echogenicity of the abscess either further reduces or, if they become chronic, increases according to the inner organization of the collection (filaments, fibrous branches or sediments) with a consensual hyperechoic appearance of the wall (pseudocapsular appearance) . Chronic myositis, follows an acute non-specific myositis, is characterized by fibrosclerotic substitution of the normal echotexture with an increase of the interstitial connective tissue that can also involve large parts of the muscle belly. Tubercular myositis is usually the result of direct propagation of bone, articular or lymphoglandular granulomas; the caseous exudate spreads through the interstitium to the muscular tissue, producing complex and extensive fistulous tracts. Haemato-geneous tubercular dissemination in patients affected by miliary tuberculosis is extremely rare. The most common viral myositis is caused by Coxsackie B virus (Bornholm's disease), and is characterized by necrotic and degenerative lesions of the muscle fibers.